Pubol is in the province of Girona in the Catalonia region of Spain. Pubol is a tiny village which was home to Salvador Dali's wife Gala. Her castle home is now a popular museum. Pubol is an attractive village with stone houses and paved streets but it would be too small to attract tourists were it not for its famous resident. Pubol was the home of Salvador Dali's wife and muse Gala. Dali bought a medieval castle in the village of Pubol and decorated it for his wife Gala. Gala lived here during the 1970s and is buried in in the grounds. After her death in 1982 Dali lived here permanently until a fire caused him to move to Figueres until he died. The house is now a museum - the Gala Dali Castle-House Museum (Casa-Museu Castell Gala Dali). Dali gave Gala lots of artworks to decorate her home and these can now be seen inside the castle. But as at their home at Portlligat near Cadaques it is perhaps to see how the couple lived that is of particular interest in the castle. The elephant sculptures in the garden and the swimming pool decorated with busts of Richard Wagner are particularly popular, as is Gala's wonderful collection of Haute Couture dresses. The museum is open 10.00 to 18.00h from March 15 to June 14 and Sept 16 to November 1st; 10.00 to 17.00h in November and December; and 10.00 to 20.00h from June 15 to September 15. The Casa Museu Castell Gala Dali is just one of three fascinating Salvador Dali Museums in the area. The museums are amazing even if you are not generally a fan of Salvador Dali's work and a visit to all of them is highly recommended if you are in the area. At Figueres is the main museum, the Dali Theatr-Museum and there is also a collection of jewells created by Dali in a seperate exhibition. At Portlligat is the eccentric home that Salvador Dali and Gala created for themselves in this tiny fishing village near to Cadaques. 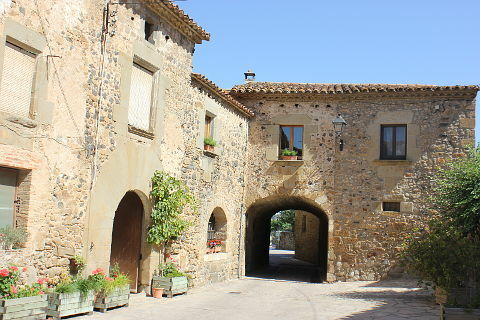 Pubol is close to the attractive city of Girona.